Carbon dioxide is a chemical compound consisting of one part carbon and two parts oxygen and represented by the chemical formula CO 2 . For a number of reasons, carbon dioxide is one of the most important gases on Earth. Plants use carbon dioxide to produce carbohydrates (sugars and starches) in the process known as photosynthesis. (In photosynthesis, plants make use of light to break down chemical compounds and produce energy.) Since humans and all other animals depend on plants for their food, photosynthesis is necessary for the survival of all life on Earth. Carbon dioxide in the atmosphere is also important because it captures heat radiated from Earth's surface. That heat keeps the planet warm enough for plant and animal (including human) life to survive. Increasing levels of carbon dioxide in the atmosphere may be responsible for long-term changes in Earth's climate. Those changes may have both beneficial and harmful effects on human and other forms of life on the planet. Credit for the discovery of carbon dioxide goes to Flemish scientist Jan Baptista van Helmont (c. 1580–1644; some sources give death date as 1635). Around 1630, van Helmont identified a gas given off by burning wood and gave it the name gas sylvestre ("wood gas"). Today we know that gas is carbon dioxide. Van Helmont's discovery was important not only because he first recognized carbon dioxide but also because he first understood that air is a combination of gases, not a single gas. Some of the most complete studies of carbon dioxide were conducted by Scottish chemist Joseph Black (1728–1799). In 1756, Black proved that carbon dioxide (which was then called "fixed air") occurred in the atmosphere and that it could form other compounds. He also identified carbon dioxide in the breath exhaled by humans. The first practical use of carbon dioxide can be traced to an invention made by English chemist Joseph Priestley (1733–1804) in the mid-1700s. Priestley found that by dissolving carbon dioxide in water he could produce a fresh, sparkling beverage with a pleasant flavor. Since Priestley's discovery lacks only sugar and flavoring to make it a modern soda pop or cola drink, he can properly be called the father of the soft drink industry. Carbon dioxide is a colorless, odorless, noncombustible gas with a density about twice that of air. It can be converted to a solid known as dry ice rather easily. 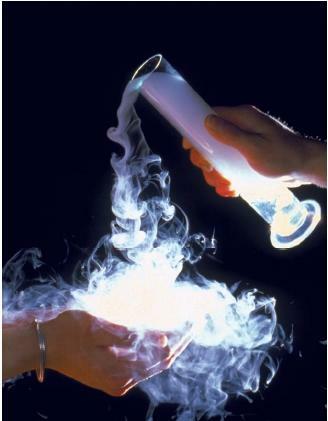 Dry ice has the interesting property that it sublimes—that is, changes directly from a solid to a gas without first melting into a liquid. All of these properties explain the most important commercial and industrial uses of carbon dioxide. Among those uses is the one discovered by Priestley, the manufacture of carbonated ("soft") drinks. The presence of carbon dioxide provides the slightly tart and tingly flavor that makes such beverages so refreshing. Carbon dioxide is also used widely as a coolant, a refrigerant, and an ingredient in the manufacture of frozen foods. Carbon dioxide fire extinguishers are often used to control electrical and oil fires, which cannot be put out with water. Because the gas is more dense than air and does not catch fire, it spreads like a blanket over burning material and smothers the flames. In addition, carbon dioxide is sometimes used as a gaseous blanket to prevent substances from decaying. In rare circumstances, carbon dioxide can be a threat to life. In 1896, a huge cloud of the gas exploded from Lake Nyos, a volcanic lake in northwestern Cameroon, a nation in western Africa. The cloud spread quickly and suffocated more than 1,700 people and 8,000 animals. Today, scientists are trying to control this phenomenon by slowly pumping carbon dioxide gas from the bottom of the lake. why cant scientist convert the c02 from cars into this dry ice to offset emission. start with cars which has a big effect. i found this site very useful, but i'd love it even more if you had some more information about the effect of CO2 on the environment and i's occurences in the known universe. thank you! Did Holdmant discover co2 gas also? Thank you this was very helpful with my Science assignment on the Carbon cycle. Thank you this was very helpful for my science fair project. This site was really helpful for me while preparing my Geography presentation because it used simple English for easy understanding. But it would have been excellent if it had much more info's added to it. Thank you. @yuan, why cant scientist convert the c02 from cars into this dry ice to offset emission. start with cars which has a big effect. I want to know how to use CO2 gas ! And What type of Business will use??? If you not busy , kindly mentioned me. i wanted to know that in which state is carbon present in our body.